Buy Trees Online. FREE DELIVERY + 3 YEAR LIMITED WARRANTY. WHY BUY TREES FROM TREES ONLINE? Lots of reasons which include, free limited 3 year tree warranty, free delivery, bulk tree order discounts, we need your business due to mortgage addiction and you are here now, finding another tree website is just hassle. All our hedging, fruit and ornamental trees come from UK sources. You can plant our containerised trees (minus the pot of course...yes we get asked) all year round. Bare root trees come without a pot or soil surrounding the roots and they can only be planted November to March, sometimes early April. Gets emotional about their height do not buy Dwarf Weeping Willow. A friend recently had to have a Biro removed by a proctologist, do not get them Aspen. Turning up to your Mother In Laws funeral with a Cornus Florida Cloud Nine. Buying Elder for someone with a much younger partner. Your friends had their budgie kidnapped by a bird of pray? Stay away from Peregrine Peach. A baby Christmas tree for your baby. Watch them both grow and use the same Christmas tree every year. Choose between Nordman, Norway, Fraser and Noble Fir trees. Click thumbnail for more . We offer a FREE TREE WARRANTY. Obviously conditions apply so we can make sure the minority of "urine extractors" do not abuse our system. Autumn is a great time to plant trees for many reasons e.g. the earth is warm and the roots establish faster, dry conditions are less of a problem, competing weeds are less of an issue and many more. This is the reason we grow August to August. Planting in Spring is just popular, not the best option for the tree. Bare root stock (comes with no pot or compost surrounding the roots) are only available for delivery from November to March/very early April. They are cheaper than containerised but MAY take a little longer to establish compared to containerised. This is because many of the fine feeding root hairs are pulled off when taken from the growing beds. Bare root trees ordered outside this time frame will be kept at our nursery for despatch until they are ready. Delivery can be up to 15 working days but is usually around 5, the busier (Spring and Autumn) and less caffeinated we are, the closer to 15 working days. A large variable are the couriers. We pay for a 24 hour service but as they frequently remind us, they never said which 24 hours. You do not need to be at home for your order to be delivered. Should you have specific tree requirements or questions you are welcome to email us here for an answer from the tree consultant. Some questions have been difficult to answer such as "are weeping willow trees safe for primary school children to be around?". We answered "generally yes so long as they have not watched "The Wicker Man" and have access to matches. We want a cheap solution to my neighbours ugly fence, what do you suggest?.... "Close one eye when walking down the garden path, close the opposite one when walking back up". We want trees that block out noise, what do you have?..... "Any twig thick enough jammed into your ears will block noise". Your webpage says tree delivery is in August, can we have one earlier? ....."Sure, is July 53rd good for you?" I would like a practical tree present for elderly Nan.....We suggest something low growing, they are much easier to climb. I have heard that talking to trees helps them grow, is this true...."It sure is. Ask them to speak up if they mind you applying a general tree fertilizer. No answer constitutes consent. 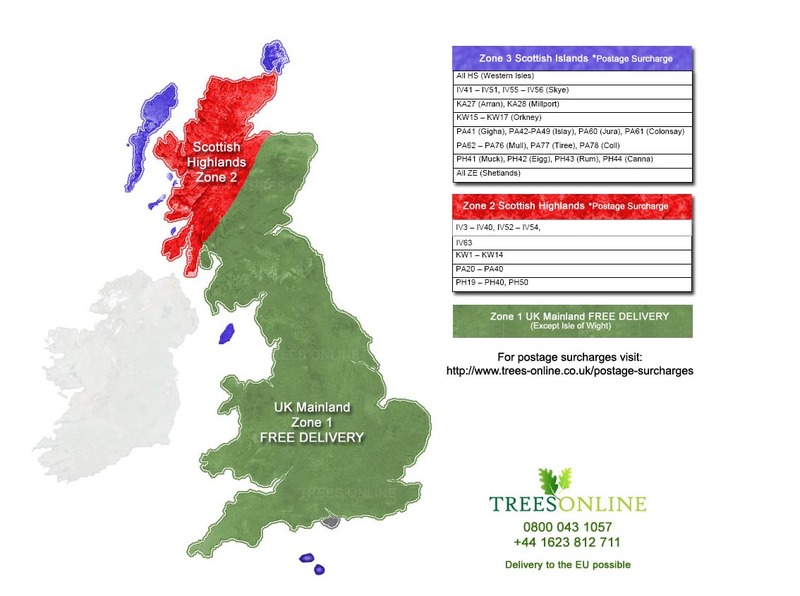 All our products now come with FREE DELIVERY TO MAINLAND UK, EXCLUDING PARTS OF SCOTLAND..
All addresses in zone 1 (except Isle of Wight) are free delivery, Zone 2 and 3 attract a surcharge. Click here or the thumbnail for a map and explanations of which post codes belong to which zones. Call us on 0800 043 1057 (+44 1623 812 711) or click here to email, for surcharge costs.